Two weeks ago on my facebook page, I promised a grain free (and therefore gluten free), dairy free, nut free and refined sugar free biscuit. Then I hurt my back, and was so low on supplies, I couldn’t even play with the recipe. Today, I finally got to my dry goods supply store, so tonight, while Master B cooked the BBQ, I whipped up the biscuits and am now procrastinating cleaning my kitchen while I type up the recipe for you all. Ahhh, the things I do for you lovely people! Put all the ingredients in your food processor (including dates and water) and pulse until it starts to glob together or forms a ball. Using clean hands, roll into balls and flatten slightly. Put on lined oven tray and bake in moderate oven (180’C) for around 15 minutes, or until golden. Another bad photo on my phone, one of these days ‘ll find my digital camera and charge it! That’s it. How easy is that?! Chocolate and cranberry version nom nom! 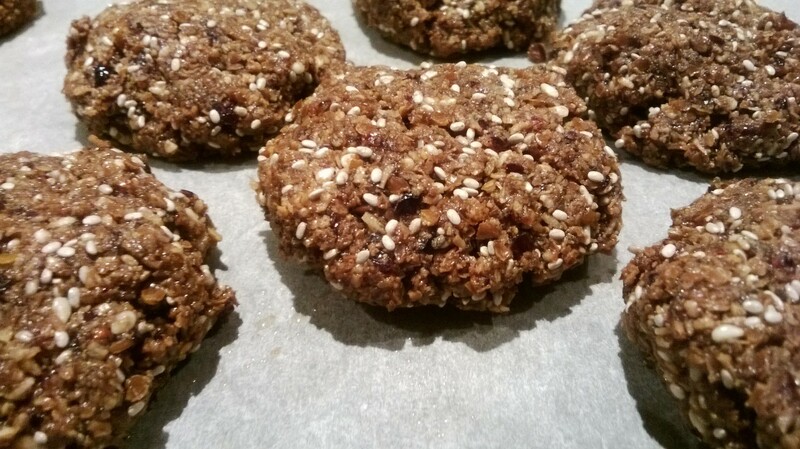 This entry was posted in Blog, Recipes and tagged best, biscuits, chocolate, coconut, cookies, cooking, dairy free, dates, easy, gluten free, grain free, kids, nut free, paleo, quick, recipe, refined sugar free, snacks, sugar free, sultanas, vegan. Bookmark the permalink. They sure are Kristin! The kids polished them all off today! Sound delicious, will be trying them tomorrow!